Heat the oven to 400°F. Unfold the pastry sheet on a lightly floured surface. Roll the pastry sheet into a 10-inch square. Cut the pastry sheet into 4 (5-inch) squares. Place the pastry squares onto a baking sheet. Beat the egg and water in a small bowl with a fork. Stir the jam and vinegar in a medium bowl with a fork or whisk. Add the strawberries and black pepper and toss to coat. Spoon about 1/4 cup strawberry mixture in the center of each pastry square. 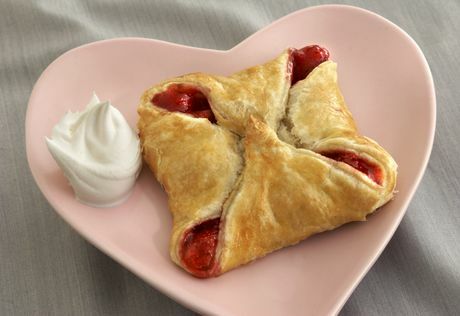 Fold the pastry corners over the filling to the center and twist the points firmly to seal. Brush the pastries with the egg mixture. Bake for 20 minutes or until the pastries are golden brown. Serve the pastries with whipped cream or ice cream, if desired.